These tiramisu pancakes are the perfect addition to your weekend breakfast or brunch plans! 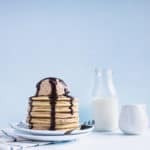 This recipe has fluffy pancakes are filled with a mascarpone, espresso and brandy filling and topped with a rich chocolate sauce. 8 oz mascarpone, at room temp. In a bowl, whisk together the melted butter and eggs. Add the milk and whisk until just combined. Add the remaining ingredients for the pancakes, whisking until the batter is lump-free. Pour the batter into a hot non-stick pan or griddle, cooking until golden brown on each side. In another bowl, combine the whipping cream, powdered sugar and espresso powder and whip until soft peaks form. In a separate bowl, beat the mascarpone until smooth. Add the whipping cream and brandy, and fold together until combined. Spread a thin layer of the mascapone filling between each layer of the cooled pancakes and top with a big scoop of the filling and chocolate sauce. Serve immediately.